A Sunday on La Grande Jatte. 1884, 1884/86. Oil on canvas, 81 3/4 x 121 1/4 in. (207.5 x 308.1 cm). Helen Birch Bartlett Memorial Collection, 1926.224. Under the Wave off Kanagawa (Kanagawa oki nami ura), also known as the Great Wave, from the series "Thirty-six Views of Mount Fuji (Fugaku sanjurokkei)", c. 1830/33. Color woodblock print; oban, 25.4 x 37.6 cm (10 x 14 3/4 in.) Clarence Buckingham Collection, 1928.1086. ...And the Home of the Brave, 1931. The painting’s title is the last line of "The Star-Spangled Banner," which was adopted as the national anthem in 1931. Oil and graphite on fiber board, 74.8 x 59.7 cm (29 1/2 x 23 1/2 in.). Alfred Stieglitz Collection, gift of Georgia O'Keeffe, 1948.650. The Old Guitarist, late 1903-early 1904. Oil on panel, 48 3/8 x 32 1/2 in. (122.9 x 82.6 cm). Helen Birch Bartlett Memorial Collection, 1926.253. Newsies at Skeeter Branch, St. Louis, Missouri, 11:00 a.m., May 9, 1910. Gelatin silver print, 8.9 x 11.5 cm (image); 12.6 x 17.8 cm (paper). Restricted gift of Charles & Ruth Levy Foundation, 1974.216. Spanish Physician, 1940. Oil on canvas, 14 3/4 x 21 1/4 in. (37.5 x 54 cm). Gift of Mr. and Mrs. Joseph Randall Shapiro, 1996.392. The Bedroom, 1889. Oil on canvas, 73.6 x 92.3 cm (29 x 36 5/8 in.). Helen Birch Bartlett Memorial Collection, 1926.417. At the Moulin Rouge, 1892/95. Oil on canvas, 123 x 141 cm (48 7/16 x 55 1/2 in.). Helen Birch Bartlett Memorial Collection, 1928.610. Bust of Said Abdullah of the Darfour People, 1848. Bronze, H. 82.5 cm (32 1/2 in.) (with socle). Ada Turnbull Hertle Endowment, 1963.839. The White Race, 1937. Oil on canvas, 81 x 60 cm (31 7/8 x 23 5/8. in.). Gift of The Leonard and Ruth Horwich Family Foundation, 2016.84. The Bathers, 1899/1904. Oil on canvas, 20 3/16 x 24 1/4 in. (51.3 x 61.7 cm). Amy McCormick Memorial Collection, 1942.457. Head of a Woman (Fernande), autumn 1909. Bronze, 16 1/8 x 9 7/8 x 10 9/16 in. (40.7 x 20.1 x 26.9 cm). Alfred Stieglitz Collection, 1949.584. Cadeau (Gift), 1963 (1921 original now lost). Flatiron and 14 iron tacks, 15.8 x 9 x 9 cm. Through prior gift of Mrs. Gilbert W. Chapman, 2009.129. Yellow Hickory Leaves with Daisy, 1928. Oil on canvas, 76.5 x 101.6 cm (29 7/8 x 39 7/8 in. ), Alfred Stieglitz Collection, gift of Georgia O'Keeffe, 1965.1180. Georgia O'Keeffe, 1918. Gelatin silver print, 11.4 x 9.1 cm (image/paper/first mount); 31.8 x 25.4 cm (second mount). Alfred Stieglitz Collection, 1949.742. Self-Portrait, 1887. Oil on artist's board, mounted on cradled panel, 41 x 32.5 cm (16 1/8 x 12 13/16 in. ), Joseph Winterbotham Collection. 1954.326. Shell Mosaic Ritual Mask. Teotihuacan, Mexico, A.D. 300/600. Stone and spondylus shell with stucco, 18 x 21 x 11 cm (7 1/8 x 8 1/4 x 4 5/16 in.). Through prior gifts of Mr. and Mrs. Arthur M. Wood and Mr. and Mrs. William E. Hartmann; Robert Allerton Trust; through prior gifts of Ethel and Julian R. Goldsmith and Mr. and Mrs. Samuel A. Marx; Morris L. Parker Fund; restricted gifts of Cynthia and Terry Perucca and Bill and Stephanie Sick; Wirt D. Walker Trust, Bessie Bennett, and Elizabeth R. Vaughn funds; restricted gifts of Rita and Jim Knox and Susan and Stuart Handler; Edward E. Ayer Fund in memory of Charles L. Hutchinson and Gladys N. Anderson Fund; restricted gift of Terry McGuire; Samuel P. Avery and Charles U. Harris Endowed Acquisition funds, 2012.2. Honey-Pop Armchair, 2001. Honeycomb-paper construction, 79.4 x 81.3 x 81.3 cm (31 x 32 x 32 in.) (unfolded). Restricted gift of the Architecture & Design Society, 2007.111. Painterly Realism of a Football Player - Color Masses in the 4th Dimension, summer/fall 1915. Oil on canvas, 27 x 17 1/2 in. (71 x 44.5 cm) (original); 27 5/8 x 17 5/16 in. (70.2 x 44.1 cm) (present). Inscribed on verso (in Cyrilic) u.c. : Football Player 1915. Through prior gifts of Charles H. and Mary F. S. Worcester Collection; Mrs. Albert D. Lasker in memory of her husband, Albert D. Lasker; and Mr. and Mrs. Lewis Larned Coburn Memorial Collection, 2011.1. Virgin and Child with an Angel, 1475/85. Tempera on panel, 33 3/4 x 23 1/4 in. (85.8 x 59.1 cm). Max and Leola Epstein Collection, 1954.283. Saint Anthony of Padua, 1485/90. Oil on panel, Frame: 41.3 x 33.3 cm (16 1/4 x 13 1/8 in.). Gift of Arthur Sachs, 1953.467. Wall Drawing #1257: Scribbles, 2008. Graphite, 9 x 6 feet. Through prior gifts of Judith Neisser and Mary and Leigh Block; Norman Waite Harris Purchase Fund, 2006.169. Reliquary Head. 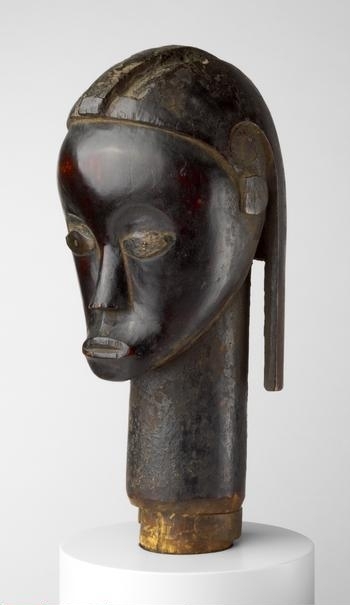 Fang people, Gabon, Mid-/late 19th century. Wood and copper, H. 39.4 cm (15 1/2 in.). Frederick W. Renshaw Acquisition Fund; Robert Allerton and Ada Turnbull Hertle endowments; Robert Allerton Income Fund; Gladys N. Anderson Endowment, 2006.127.